An alt tag is descriptive text that you can add to your images. It helps make your article accessible to people using screen readers and other assistive devices. Insert your image into the article as usual (you cannot copy and paste images into articles, always use the image button in the editing toolbar). Select the image you just inserted. 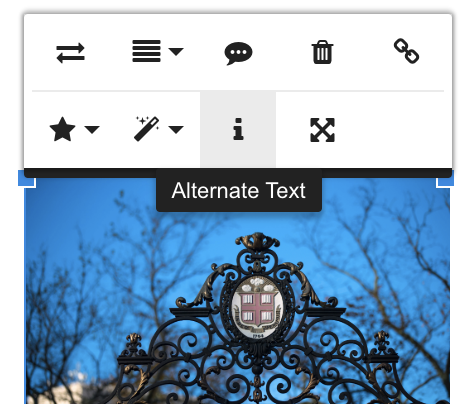 In the menu that appears, select the Alternate Text button (indicated by "i" icon). Type your desired alternate text, then click Update. Finish editing your article as desired and Save. No need to include "image of", "picture of", "screenshot of", etc. Be descriptive. For example, if you have a screenshot of entering an override code in Banner, the alt text should be something like "entering an override code in Banner" and not just "Banner"
Make sure the steps in your documentation don't just refer to the image (e.g. "click the button seen in the image below") but describe the steps fully so someone would not need the image to complete them.